Begin by roasting the sweet potato and eggplant. You can be conventional and put them in the oven for an hour or more, or cheat a bit and give each one six or so minutes of microwave blast. If you go with the microwave, remember to poke the outsides with a fork or knife (fun fact – either one can explode in a microwave if the skins aren’t broken in regular intervals). After cooking they should be set aside till they’re cool enough to handle. 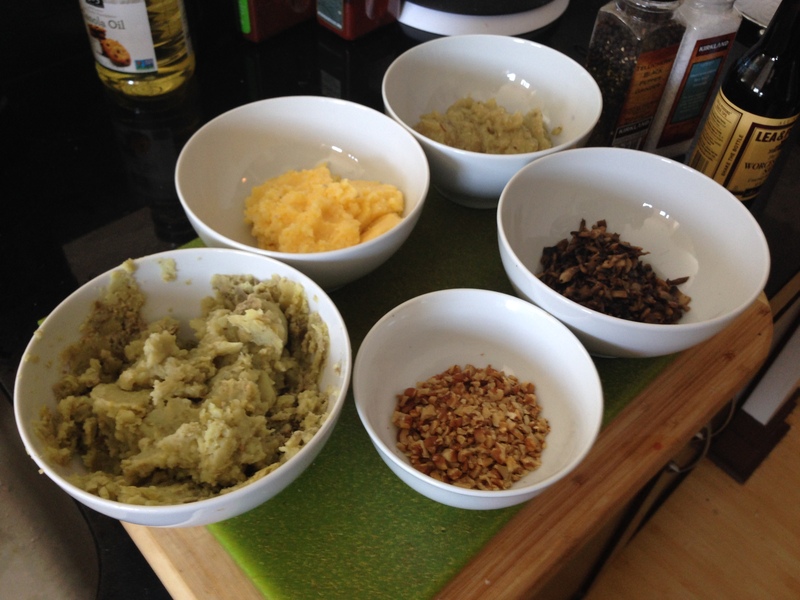 Most of the ingredients before assembly. You want about 1 1/2 cups each eggplant, sweet potato and polenta. Finished mushrooms and walnuts are also in the picture. Bring 1 ½ cups of water to boil and stir in the yellow cornmeal to make polenta. Once it begins to thicken, stir in the cheese. Put some tinfoil in a pan, pour on the polenta, and place it in the fridge to set for at least 15 minutes. The third step is to sauté the mushrooms in canola or some other unflavored oil, adding copious amounts of pepper. The combination of mushroom and pepper will be the heart of your savory taste. Once done, place them in a bowl and put in the fridge to cool. Now strip the skins off the eggplant and sweet potato. Cut up the eggplant and pop it in a cuisinart or blender until pureed. Then mash the sweet potato with a fork. Remove the polenta and mushrooms from the fridge and mix in a large bowl with the eggplant, sweet potato and all other ingredients. Taste to see if more salt or pepper is needed (since parmesan has a lot of salt you may not need any more). Return this to the fridge for about half an hour to stiffen. 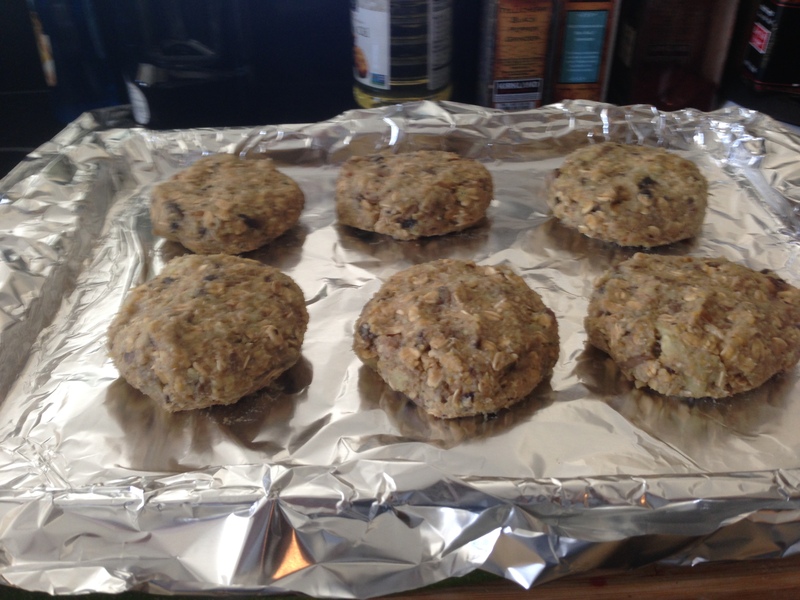 Pre heat the oven to 400° and form the mixture into patties. 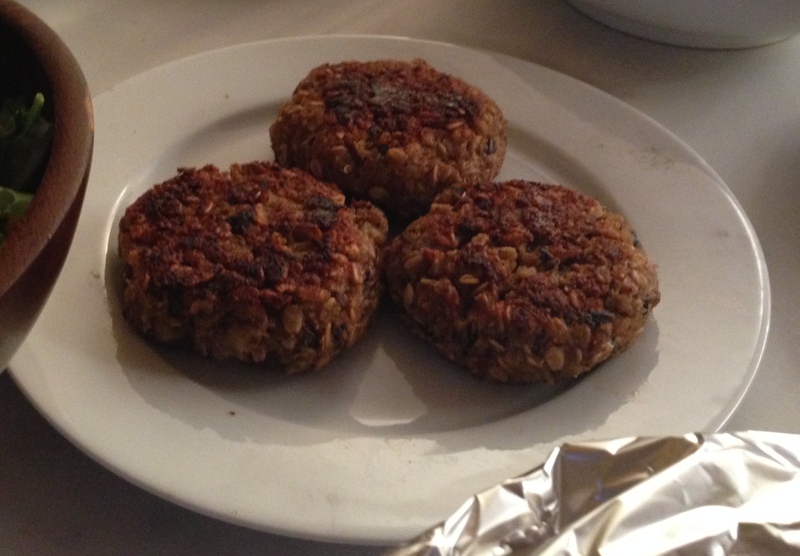 Normally veggie burgers are thin, but it’s OK to make these about half an inch thick. Place the patties on an oiled baking sheet and cook for 30 to 45 minutes — until the texture is firm. At this point these could be refrigerated or frozen for later use. 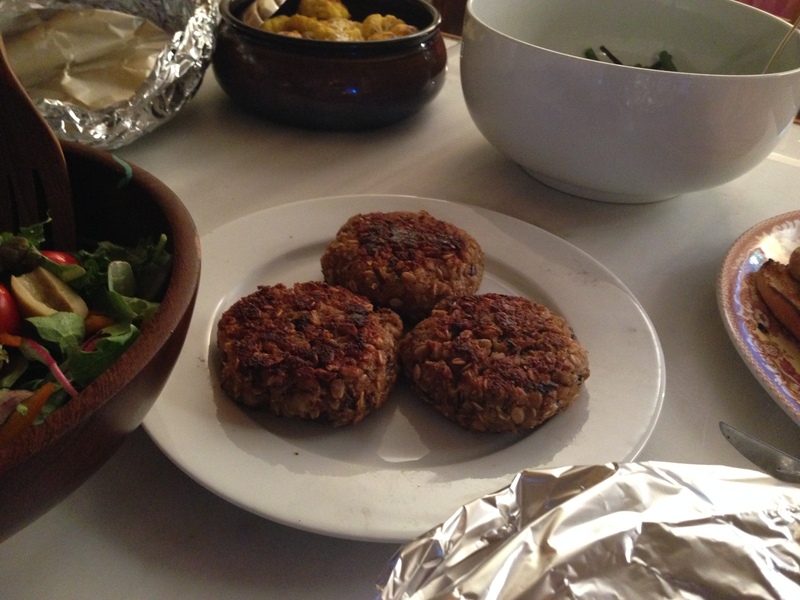 The patties should be thick because they’ll first be baked. Check them at 15 minute intervals since the thickness will determine baking time. Finish the burgers by browning them in a frying pan with a little oil or butter, serve it on a bun with the regular condiments and trim. And dream of cows. Enjoy! You’ll want a pronounced condiment. Try making a sauce of mayo, paprika, mustard and maple syrup (yes, syrup).